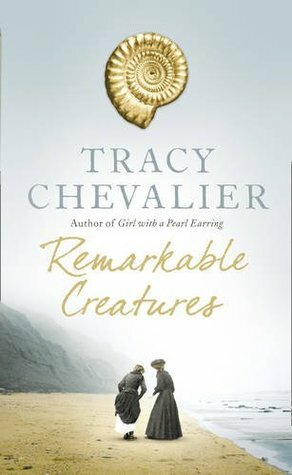 In the past I’ve enjoyed reading Tracy Chevalier’s books, so when I saw the book Remarkable Creatures, I thought this is a book I definitely need to read. The book starts out in with Elizabeth Philpot moving to a small seaside town in England. She soon meets a young girl named Mary Anning. Mary is an unusual girl for the 1800’s, she has a talent for finding fossils. Even though Mary is uneducated, she has a vast knowledge of the fossils in the area. Elizabeth spends time with Mary hunting fossils. When Mary finds an unusual fossil find her life begins to take a different course than the other girls in the town. Little does she know that she will become an expert in the field of fossils, and that she will develop a life-long friendship with Elizabeth. I really loved this book for many reasons. Chevalier is able to tell a really great story that holds my attention. The book has really strong female characters who march to the beat of a different drummer. In their day Mary and Elizabeth were quite odd because they chose a life of fossil hunting. Mary chose it as a livelihood, and Elizabeth chose it as a hobby. And Mary becomes an expert in the field. This is quite a feat for a poor young woman in the 1800’s. The book also shows a time when the world is changing. Long held beliefs are being challenged by Mary’s finds.